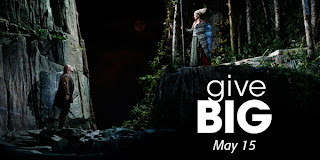 Seattle Opera Blog: May 15, 2013: GiveBIG to Seattle Opera! May 15, 2013: GiveBIG to Seattle Opera! On Wednesday, May 15, Seattle Opera will participate in GiveBIG, a 24-hour community-wide challenge to give generously to nonprofit organizations through The Seattle Foundation website. Last year, because of your generous support, Seattle Opera was 10th place out of over 1,200 nonprofit organizations for the total amount received. On May 15, your gift to Seattle Opera will be doubled! Thanks to a special challenge grant, your donation to Seattle Opera through GiveBIG will be matched dollar for dollar. Win a Golden Ticket: Throughout the day individual donors will be chosen at random to have an additional $1,000 and a round-trip Alaska Airlines ticket donated to the organization that received their donation. The winning individual will receive a $100 gift card to Starbucks. Give early in the day to increase your chances! At the end of the day, Seattle Opera will receive a pro-rated portion of the “stretch” pool (For example, if we receive 5% of the total donations, we will receive 5% of the “stretch” pool.) Last year, the “stretch” pool was $800,000. What can my gift do for Seattle Opera? Satisfaction that you helped Seattle Opera share timeless musical stories through mainstage productions and educational programming with more than 800,000 people a year. Knowledge that you helped secure the future of a world class opera company. We need your help raising $2.7 million before our fiscal year ends on June 30. Giving Benefits that bring you closer to your opera company. Play your part in Seattle’s biggest day of philanthropy. GiveBIG on May 15!